Fractures/Broken bones in children are very common and Dr Slattery has extensive experience treating these and the problems that they can present. As children are still growing and have different anatomy, they are not ‘mini adults’ and they need special consideration and treatment. 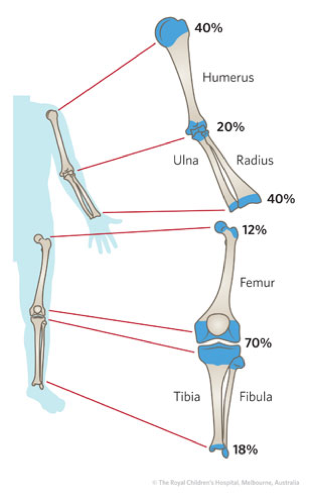 Children’s bones and resulting injuries are quite different from those affecting adults. Children have growth plates which can be injured, and these can have long lasting consequences if not treated appropriately. Children’s bones also are softer and more elastic than adults due to the presence of blood vessels within them (‘Haversian canals’), this makes it much easier to bend rather than break/fracture a child’s bones – similar to trying to snap a ‘green tree branch’ rather than a dried out piece of wood. Similary, children’s bones are covered in a very thick layer of supporting tissue called periosteum, which asssists in fracture healing, this supports and heals childrens’ fractures much faster than adults’. Children also have great potential to ‘remodel’ or ‘grow out’ deformity from fractures, which adults cannot do.